Vape Drive gathers essential data from multiple marketplaces to give you accurate vaping and e-cig products price comparison and keep you up to date with the latest industry news. Here, you can check and compare pricing across multiple stores, check the stock status and delivery policy. We simplify your customer experience by telling you all you need to know to always find the best possible deal. 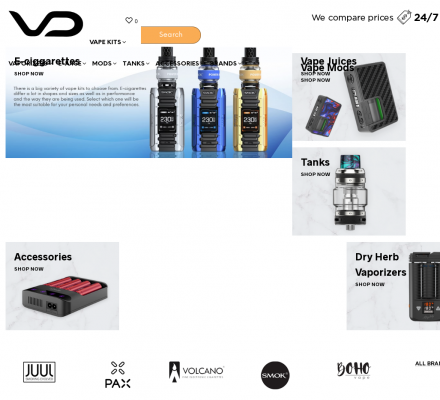 Description: Shopping, General Merchandise, V - VapeDrive.com: The #1 Tool for Searching Vape Stores, Smoking Accessories, and Prices Online. Vape Drive gathers essential data from multiple marketplaces to give you accurate vaping and e-cig products price comparison and keep you up to date with the latest industry news. Vivian Greene (Popularity: ): A selection of greeting cards, motivational books and prints. Vincent Van Dough (Popularity: ): Canadian supplier of handcrafted Christmas ornaments, magnets, pins and coin catchers. Vortex Gifts (Popularity: ): Selection of designer jewelry, world music, books, far eastern gifts, and toys. Victorian Charm (Popularity: ): Cake plates, candles, bath and body, decor, and fragrances. Venture Marketing Group (Popularity: ): Offers safes, gas logs, outdoor fireplaces, and camping products. Verts Creations (Popularity: ): Offering chocolate-covered cashew brittle, textile and knitting patterns, kits for wooden toys, chests, and buckets.